To start off, let’s review the amount of silver rounds Provident Metals offer. 6 different silver rounds are available from Provident Metals. From the most popular silver round the Buffalo design, the Incuse Indian design, Saint Gaudens mold, both Morgan and Peace Dollar replica, and finally the Englhard Prospector. Apart from the different designs, Provident Metals offers different ounces per design. From the traditional 1 ounce, to fractional, half-quarter, even 10 ounce weights, they give the consumer the choice in various ounces. Provident Metals has one, if not the one, largest selection of unique silver rounds designs. Next to the unique designs offered, Provident Metals goes further and farther than most with extremely fast shipping. As another customer illustrated, “Phenomenal. Just made my first PM purchase of any kind (1 oz silver rounds)…couldn’t find a better price over spot all inclusive of shipping/CC fees, and couldn’t be any happier with the time it took to show up at my door (~3 days). Thank you!” This customer explained it best when he said he couldn’t be happier with the fast shipping Provident Metals provides. 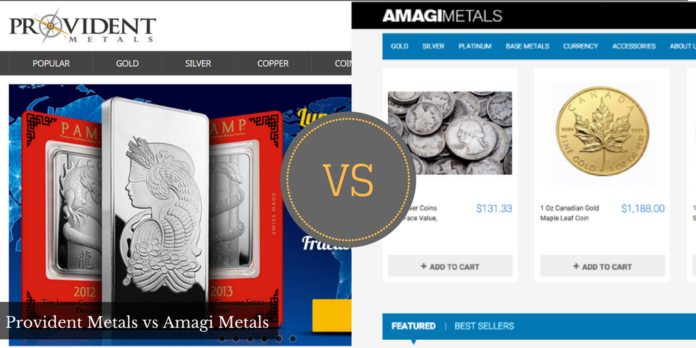 Find out if Amagimetals.com is worth your business in this review. These days, one of the fastest, easiest and most convenient ways to find high-quality precious metal, including bullion coins and bars, is by going online. Within the last 10 years or so, the market has become flooded with online precious metals dealers. Many have been around for at least that long, but Amagi Metals is an exception. Founded in 2010, it is one of the newest options out there. In this industry, though, age really is just a number. In many ways, Amagi Metals has already set itself apart from the crowd.